Are you worried that your little angel does not epitomize the image of the quiet and peaceful child, who sleeps soundly? Snoring, whether due to allergy or obstructive sleep apnea, isn’t something you ought to ignore. But thankfully, you can always turn to MomJunction to learn about the causes, symptoms, and solutions for snoring in children. Perhaps, after reading our post and taking the necessary steps, you can turn all misty-eyed watching your little bundle of joy sleep undisturbed and soundly. 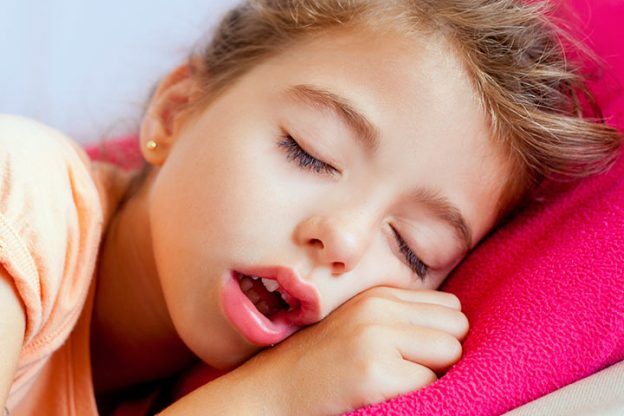 A majority of children snore now and then, and around 1 out of 10 kids snore practically every night . But, what is snoring? Well, it is the growling or groaning noise that your child’s nose or mouth makes when he is asleep. It occurs when he breathes in, and there is some obstruction at the back of his mouth that prevents air from flowing freely. When the air passage opens and closes, it results in a vibration of the throat tissue. How loud this tissue vibrates depends on the amount of air passing through the passage and the speed of the vibration. Children aged three and older tend to snore when they fall into deep sleep. If the child snoring is not due to a problem, like obstructive sleep apnea, there is no reason to worry. On the other hand, if your child has a problem that causes him to wake up from sleep often or your child finds it difficult to draw oxygen into his lungs, he requires treatment. If your child snores while sleeping, it is important to understand the causes. It lets you take an informed decision when you are seeking treatment for the causes. Many children are allergic to pollen, which causes their noses to turn stuffy. A blocked nose, filled with mucus, makes it difficult for the child to breathe. And, this, in turn, causes them to snore. Adenoids are glands located near the nasal passage, whereas tonsils are located at the anterior part of the mouth, at the opening of the throat. Both these glands help trap bacteria and prevent their entry into the body. Sometimes, the adenoids and tonsil get swollen, leading to snoring. In fact, many children have chronically inflamed adenoids and tonsils. So they never stop snoring. 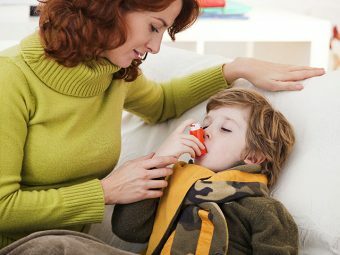 If your little one has a sinus infection or cold, it could block the nasal passages, making it difficult for your child to breathe. This blockage causes a rattling noise while your child breathes during his sleep. The nasal septum is the cartilage and tissue that separate the two nostrils. Some children are born with a crooked nasal septum that makes one nostril smaller than the other . The airflow in the smaller nostril gets obstructed, leading to breathing difficulties and snoring. If you have a child who spends all his time in front of the TV or playing video games, you will be combating obesity in your child. Being overweight causes the nasal air passages to narrow, and this could be the reason your overweight child snores. Children with Down’s syndrome, muscular dystrophy, and cleft palate tend to snore because they have significant hypotonia or a weak muscle tone. Such children are at a higher risk of snoring while sleeping. When you smoke, you expose your child to secondhand smoke. Not only is this smoke harmful to your child, but it also irritates the nasal passages and airways, causing them to get inflamed. Passive smoking leads to snoring due to blocked nasal passages and airways. Anything that causes obstruction in the airways can make it difficult for your child to get sufficient air into his lungs. This leads to obstructive sleep apnea, which leads to snoring among children. If your child has sleep apnea, he will stop breathing for a few seconds every night. This could occur as often as 30 to 300 times each night! It means your little one is not getting oxygen while sleeping and also does not wake up feeling rested. Sleep apnea can have a profound effect on your child’s wellbeing. Your child exhibits a range of symptoms of snoring. You need to be able to detect them so that you can decide whether your child needs medical treatment for the snoring. You need to remember that children who snore and have sleep apnea have many symptoms similar to children with ADHD (attention deficit/hyperactive disorder). Hence, it is important to get the right diagnosis so that your little one can get the right treatment. Many a time, children end up being treated for ADHD, when in reality they have obstructive sleep apnea. Before you take your child to the doctor, make sure you jot down the symptoms. Sleep apnea requires a sleep specialist. If your child snores, your pediatrician will direct you to a sleep specialist. The specialist will diagnose whether your child suffers from sleep apnea. To diagnose sleep apnea, your child will need to participate in a sleep study at a sleep center. This study is known as a polysomnogram. Your child will have to stay overnight. So bring your PJs, as well. 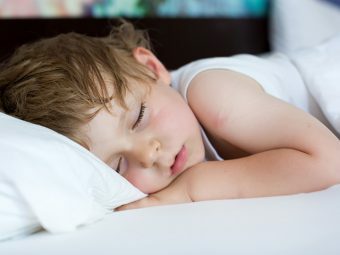 You may have to be a little alert in the night, as the next day the sleep specialist may ask you whether your child’s breathing and sleep were similar to what he displays at home. 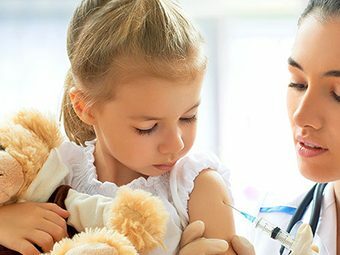 The doctor will connect sensors to your child’s face, legs, chest, and hands. These sensors do not cause any pain so don’t worry. Once your child goes to sleep, the sensors will start transmitting electrical signals to a computer. This study is completely safe and does not pose any risk or danger to your child. Once the electric impulses reach the computer, they are printed. The printout allows the sleep specialist to study the patterns of your child’s brain waves, breathing, and heartbeat. It also gives details about your kid’s muscle tension during sleep, and leg and eye movements. A polysomnogram is the only precise way to determine whether your child has sleep apnea and the severity of the problem. 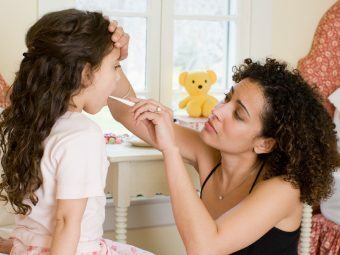 The doctor will also recommend surgery if your little one has a structure problem with his jaw, face or throat. This surgery is different from the one undertaken for adenoids and tonsils (adenotonsillectomy). In case the doctor finds a structural problem with the jaw, he may recommend using an orthodontic first. Surgery is not always the first line of treatment for such problems. Your child would have to wear a customized mouthpiece while sleeping . The mouthpiece holds the lower jaw in a forward position so that it does not obstruct breathing. One of the solutions for snoring in children is Continuous Positive Airway Pressure or CPAP. It is useful for treating sleep apnea and sleep-related breathing problems in children . Usually, doctors recommend auto CPAP for children, as the pump automatically detects abnormal breathing events and adjusts air pressure accordingly. In case your child is overweight or obese, the doctor will suggest exercises or a diet change to reduce your child’s weight. The exercise also makes the throat and neck muscles strong. The strengthened throat muscles help treat sleep apnea brought on by your kid’s not-so-ideal weight. Since your child wakes up several times gasping for breath during the night, he will wake up feeling tired and fatigued. This will make him cranky and irritable, and also affect his performance in school. He will complain of daytime drowsiness, as well. As your child will be so anxious to sleep, he may not wake up to urinate if the urge comes while he is sleeping. This will cause him to wet his bed, leading to further frustration and depression. When a child feels the urge to urinate and does not get up at night because he wants to sleep, it could result in night terrors and nightmares. This, in turn, worsens the quality of sleep. Children who snore and suffer from sleep apnea tend to display symptoms similar to children with ADHD. This can make it tough for you and educators to manage the child, as he will be hyperactive and disruptive. Your child may also have issues staying put and paying attention to what he is being told or taught. During infancy and childhood, the brain develops and grows. Most of the development and growth take place while your child sleeps. However, if your child snores and has breathing problems, less oxygen reaches the brain. This could adversely affect the growth and development of the brain, leading to learning difficulties . When the brain is starved for oxygen, brain cells die. This affects your child’s cognitive abilities, causing him to perform poorly at school. Studies show this can be a lifelong consequence of sleep apnea. As your child gets up several times during the night and also experiences episodes of low oxygen, it causes the nervous system to come on and go off. This exerts pressure on the heart. 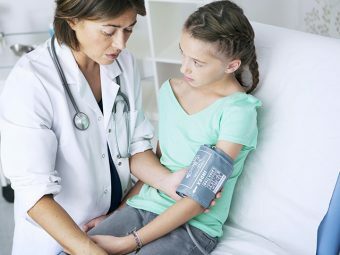 Over time, your child will experience elevated blood pressure, making him more susceptible to hypertension as an adult. Children with sleep apnea and snoring often wake up feeling extremely hungry, and their body yearns for empty calories from sugars and fat. So they resort to eating unhealthy food that causes them to put on weight. This, in turn, worsens their sleep apnea and snoring and also predisposes them to cholesterol and prediabetes. You can use many tips and tricks to prevent your child from snoring, particularly if the snoring is due to a sinus infection, allergy or cold. If your child has a stuffy nose due to a cold or seasonal pollen allergy, run a humidifier in his room while he sleeps. The increased level of humidity in his room helps decongest his nose and prevent him from snoring. Remember to use the cool-mist setting in the humidifier. Warm mist can result in steam burns. Some children have dust allergy that results in nasal congestion. If your child suffers from this allergy, keep an air purifier in his room to run continuously. It will remove the allergens from the bedroom and alleviate the stuffy nose that causes him to snore. You can use an over-the-counter nasal wash to remove excessive mucus from your child’s nose. It also removes allergens from the nose. Once you remove the mucus, it will unblock the nasal passages, preventing your child from snoring. Colds, allergies and sinus infections can cause inflammation of the nasal lining. This swelling causes the soft palate to vibrate when your child sleep, leading to snoring. Saltwater nasal spray can ease the swelling of the nasal lining, thereby stopping the snoring. Mix quarter teaspoon kosher salt in add half cup of boiled water. Stir until the salt dissolves. Store the saltwater in a nasal spray bottle and irritate your child’s nose before he retires to bed. Do not use more than two to three drops per nostril. After five days, prepare saline solution afresh. You can also add a few drops of oil in hot water and let your child do some steam inhalation. It is one of the best home remedies for snoring caused by colds and allergies. We already know the health benefits of olive oil. But did you know it also can help your child if he snores? The oil helps moisturize the tissues at the back of the throat and nose. This reduces friction, allowing air to move freely. As a result, this stops your child from snoring during sleep. Give your child one tablespoon of oil to sip two to three times. Do it just before your little one goes to bed. Use four to six drops of thyme essential oil and mix with equal quantity of olive oil. Rub the oil blend on the soles of your child’s feet. Alternatively, add the undiluted essential oil to the humidifier in your kid’s room. Do not use thyme oil if your child is under six years of age. Mix two to four drops of eucalyptus oil in some hot water and let your child inhale the steam with his head covered with a towel. Make sure he inhales with his mouth and nose. It will cause the nasal passages to decongest and also ease the swelling of the nasal lining and throat. Take eight to 10 fresh mint leaves and steep them in a cup of hot water for about 10 minutes. Strain and add a teaspoon of honey. Let your child sip the hot mint tea before going to bed. Let him also inhale the steam the tea emits. Wash, peel and crush one inch of ginger root to release the juices. Boil the crushed ginger with a cup of water. Boil for three to four minutes, and then let the tea steep for another five minutes. Strain the mixture and add honey, which also is a lubricating and antibacterial agent. Mix well and let your little one drink the potion to ease nasal and throat inflammation. When the inflammation reduces, your child will be less prone to snoring during sleep. Get your child to exercise his tongue and throat muscles. This will make the muscles stronger and prevent them from collapsing backward. As a result, it will reduce incidences of snoring. Get your child to say the vowels from the English language. Make him do it loudly for three minutes three to four times a day. Ask your child to close his mouth and then purse his lips. Let him hold this position for 30 seconds. Do this three to four times a day. Get your little one to open his mouth and then move his jaw to one side and hold the position for 30 seconds. Then get him to move the jaw the other side and hold for 30 seconds. You may not have a child who sleeps through the night peacefully, but this is not a reason to ignore snoring. If your child snores even after taking preventive measures, it is best to consult a doctor to find out the cause. This way, your child will receive the right treatment, and coupled with the home remedies, you can ensure there are lasting effects of the snoring. Does your child snore? What measure have you taken to prevent his snoring? We want to hear from you so, do comment below.